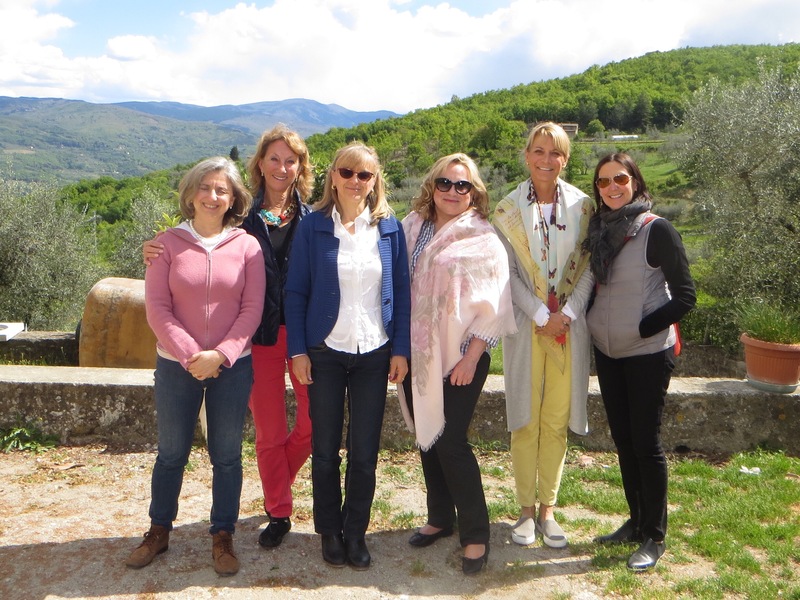 In April 3 girl friends and I went to Italy for 10 days of drinking wonderful wines, sharing wonderful local cuisine and shopping. We flew into Rome and took a train to Florence where we spent our first night. (If you have business class seats on the train you are welcome to use the private lounge in the station while you wait for your train to depart.) We stayed at the Hotel de La Villa on Via de Tornabuoni. The hotel staff was very helpful, the rooms are not large, but the location was good. We wandered the streets watching the crowds and buying a few simple things at the famous Santa Maria Novella only a couple of blocks from the hotel. Then stopped at the best scarf store in Italy, FALIERO SARTI, on Via Della Spada, be sure to detour. For sure you will find something you can not live without. We joined friends for a perfect dinner at FUOR d’ ACQUA, on Via Piscana, well know for the freshest fish in town. Our waiter was willing to help us share several dishes starting with a large antipasti platter then fresh pasta and fish that had just come to the restaurant that morning. The next day we were up early and headed to Angela Caputi across the river on Via S. Spirits 58. Angela Caputi has wonderful fun jewelry that you will want to buy. She makes everything in house so they can help you with whatever strikes your fancy, must do. We also stopped by an amazing fabric store VALLI on Via Della Vigna Nouva, if you sew or want to buy fabric to take home this is a must. We rented a car and ventured out to the country side. 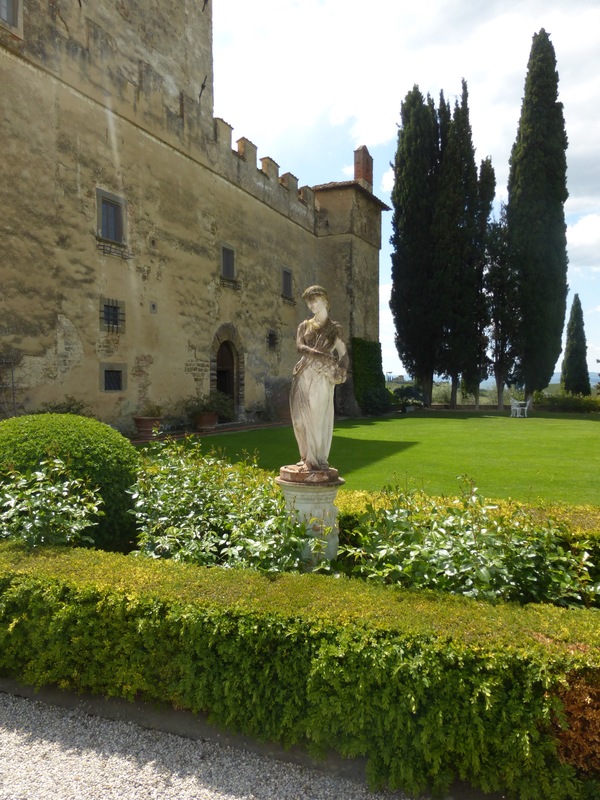 We were staying in a lovely castle, Castello Della Paneretta in Barberino Val d’ Elsa. Make sure you request a GPS in your rental car to find your way around the area, finding the small wineries makes you feel like you are on a scavenger hunt. After getting settled in this lovely estate we ventured out to the CoOp to buy snacks and something for breakfast. It was April and we had planned on warmer weather, so just be prepared since the wineries are often cold and the wind catches you off guard. Once again we were in the car looking for our restaurant for dinner. We ate at ‘LA TOPPA” in the village of San Donato about a 30 minute drive to the area of Poggio. The restaurant is local owned with the mother making the pasta by hand, we knew we were in Italy. The next morning we toured Cantine Bellini/llPazzo, this winery is closer to Florence, so we had quite a drive. We were in the Rufina area and this winery makes Chianti, Chianti Classico, and nice vin Santo wines. They gave us a wonderful introduction to the difference between the two Chianti wines and the grapes grown to produce their products. Many of the wineries in this area also produce wonderful olive oil. You will taste great differences in the oils depending on the soil the trees grow in and how the oil is processed. Some are very mild while others have a wonderful pepper finish. After a special lunch prepared by Maurizio and his family served with their wines, we headed to an area across the valley called Pontassieve. The winery Castello del Trebbio, is also family owned and Alberto welcomed us even though we were late. Castello also produces a Chianti and Chianti Classico wine using only the grapes they grow. Their Lastricato, reserve Chianti and a lovely white Pazzesco Chianti gold were a special treat. The next morning we were guests at Querceto di Castellina a lovely property just out side the village of Castellina. Jacobo along with his family have created a beautiful winery with a nice kitchen for cooking classes. They also offer rooms and apartments for rent. Info@ Querceto.com, contact Jacobo Di Battista. 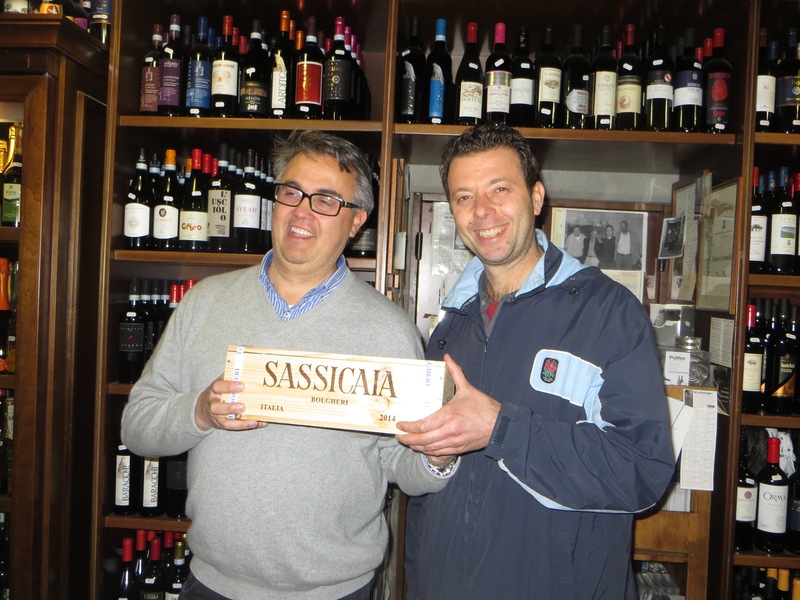 Many of their wines are not sold in the U.S. so we took advantage of the opportunity to ship wine and olive oil home, I loved the SEI and FURTIVO wines. 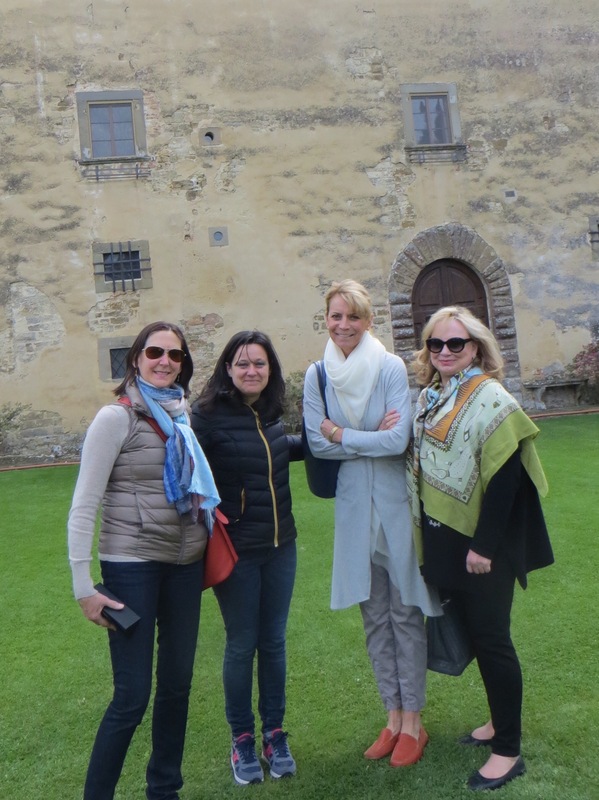 We headed back to Castello Della Paneretta for a tour of the castle built in 1596 with the family still living in the house. 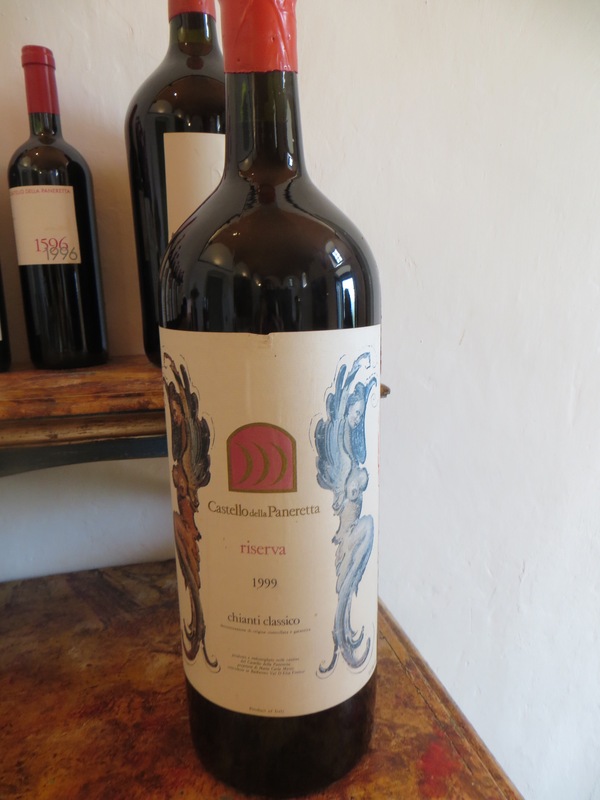 After a tour of the house and wine cellars we were served beautiful lunch and continued a long conversation about the use of the red varital Sangiovese grape. Their Quattrocentenario reserva 2008 wine (100% Sangiovese) was the highlight of the trip. We all shipped home several cases. After a rest and nap, that evening we had a special dinner at OSTERIA 1126. The road to the restaurant will make you wonder if you will every find the front door, and it is well worth the drive to Cinciano, Poggibonsi. We shared lovely beef carpaccio shaved paper thin, a starter of lentils with a soft mild goat cheese, and several main courses. have They have an extensive wine list, with many of the wines of the region. Don’t miss the soft chocolate molten cake and ice cream. 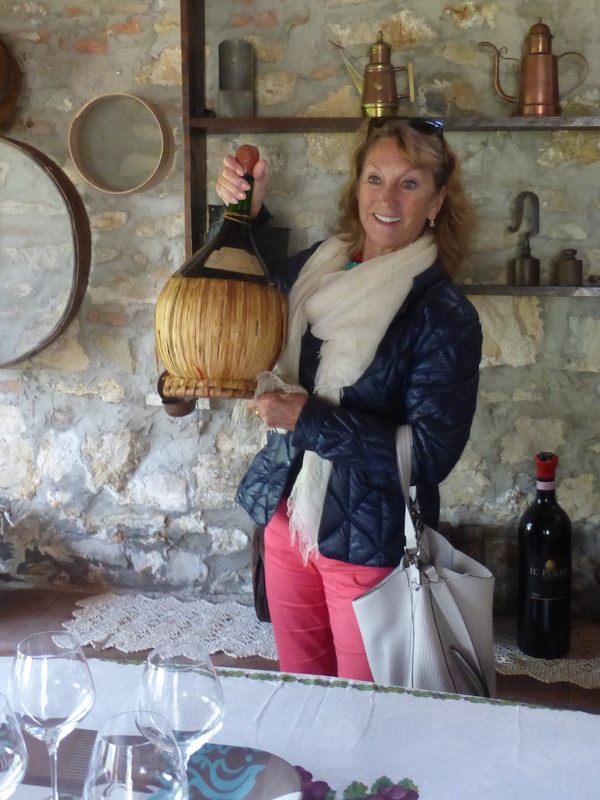 The next day we headed back to our last wine tasting at Fattoria La Castellina, this wine store/ cellar are located together in the village of Castellina making easy to shop after tasting their lovely wines. 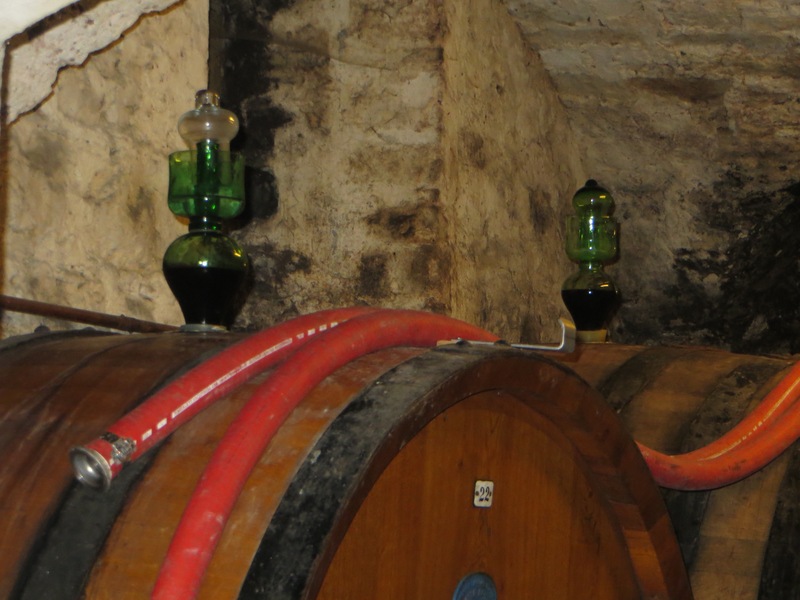 One very interesting thing we saw at many of the wineries is the use of a glass vessel, a COLMATORE, placed on the top of the barrels to allow the wine to expand as it forments during the first months in the barrels. Fattoria also own and rent a large house, LA FERROZZOLA Agriturismo Hotel, Alberto Palazzo Squarcialupi. After tasting wine at 10 am, we ventured over to visit a jewelry store, TOSCANACCIO, Via Ferruccio 44, owned by Marco and hosted by his sweet attention seeking dog, ToTo, Several of the girls bought beautiful pieces that Marco created from stones he had found in his travels around the world – worth a visit if you are near Castellina. We then drove about an hour and half to Cortona where we stayed at a friends house, Casa Spare, high on the hill with an amazing view. We had a simple lunch at Tuscher in the village – lovely bruschetta, one with chicken liver and another with perfect chopped tomato and plenty of local olive oil. Walking and shopping in Cortona is fun because very few cars are allowed and the many local shops offer nice products from the region. We made an appointment with Marco at his wine shop, MOLESINI-MARKET, wineshop@molesini-market.com, for a tasting the next day at noon. We ate a simple dinner in a small slow food restaurant, Taverna Pan e Vino, offering interesting pasta cooked to perfection. I had fresh young local goat cooked perfectly. The next morning we went into the center of town to their Saturday market and came away with everything from dried mushrooms to hand decorated jeans jackets. Now it was noon and time for an amazing introduction to wines we do not often see in the U.S.. Marco and his brother served a variety of regional white wines and thouroughly explained their differences. I fell in love with Monteverro 2012 Chardonnay and 2012 Paleo Le Macchiole red. We were able to ship cases of our favorites back to Seattle, most of which are not readily available in the states. Marco is a perfect contact for those wines you cannot find. Just remember Molesini. We had dinner in the square at “Osteria del Teatro” and walked back down the hill to where we had parked the car. The next day we drove back to Florence to drop the car and take the fast train back to Rome. It was about a 2 hour drive and we could have just as easily driven to Rome, but did not realize that until we were already committed to returning the car in Florence. We arrived in Rome, checked into INN AT SPANISH STEPS, Via Dei Condotti 85. We booked with Platinum AMEX and were given a nice upgrade. The hotel is one block off the Spanish steps – a good location. The rooms occupy several buildings so our room was in a separate building 2 blocks away from our friends. Both of the hotel buildings are lovely, offering a roof top garden to have breakfast or a late afternoon cocktail. We wandered the narrow streets shopping and enjoying all the hustle and bustle of this area. We had all spent time in Rome and had visited all the major sites so this time we just shopped and ate lovely meals. Dinner was at “ANTICO ARCO”, http://www.anticoarco.it, a little bit out of the way, but a great meal in a charming old house. We shared a pasta of pecorino cheese and black truffles, beautiful shaved asparagus salad and sea bass. Nice find. Our last day in Rome was a holiday so the city was busy. We wandered the streets again and bought a few special things to add to our spring wardrobe back home. Then we had a perfect lunch at The De Russi Hotel in the garden. They offered a lunch buffet that was such a treat. One of the vegetables that we had seen in the market and on other dishes is AGRETTI, or Salsola Soda, it looks like sautéed chives but has a very mild taste. Look for it. Reserve in the Du Rossi garden for lunch or dinner and you will have a meal to remember. We walked back through the Piazza del Popolo up to the Borgese park area and looked out over Rome. We had a late dinner a couple of blocks from the hotel at Dilla, a simple local fun place. We had a very nice bottle of white, Le Vigne di Zamo 2012 that went well with the asparagus risotto and eggplant parmigiana. Next morning we headed home saying good bye to Rome until our next visit. While in the cab heading to the airport we realized only two of the girls got up early and headed to the Vatican for an early morning tour. It was really the only tourist attraction visited during the whole trip. It was about wine, food and friendship, a little shopping too. After planning a trip to explore the food and culture of Brazil it was time to apply for a visa, which is required for all U.S. citizens. If you plan a visit to Brazil it could take as long as 3 months once you send in your passport along with the required paperwork. So be prepared to not travel out of the country during the wait time. I did the required forms on line instead of using a local company and paying the $425 fee which I have been told helps speed up the wait time. We flew from the U.S. to Rio, changed planes and went on to Iguazu Falls for a visit to the world renound tourist attraction of Brazil and the northern tip of Argentina. Our guide delivered us to Sheraton Iguazu resort. The only hotel located on the grounds of the Iguazu National Park on the Argentina side. From the deck of the hotel you can see the falls in the distance. Connected by a huge trail system and a small train taking you to the head of the falls. The next morning after an early morning breakfast we headed out on our own to explore the falls. Along the way we came upon some local wildlife of the region including the little raccoon looking coatimundis, many butterflies. It was close to 100 degrees so we spent the morning walking on the many trails along the falls. After lunch we went on a raft trip along the river that takes you up to the bottom of the falls where we were all soaked as the amazing falls tumbles down to the river below. Be prepared to hike down the long set of stairs to reach the rafts and then the hike back up to your transport back to the hotel, worth the adventure. That evening after a little rest we took a taxi into the town of Iguazu for a chance to watch the sunset at the place where all 3 countries, Brazil, Argentina and Paraguay meet. We stopped for a famous cocktail, the caipirinha, made with the local liquor, cachaca made from sugar cane. Dinner at “La Rueda” where they pride themselves in serving famous local river fish was a great introduction to the local cuisine. The next morning our guide came back to pick us up and drive us to the Brazil side of the falls for another view. Then we decided to take the short 15 minute helicopter trip over the falls, the cost is around $120 each but worth the time and adventure. Ending our time in Iguazu we said goodbye as we headed back to the airport for a 2 hour flight to Rio for the next part of our trip. We arrived in Rio our wonderful guide, Rodrigo, camera.rodrigo2@gmail.com, met us and took us to our hotel. The beautiful boutique hotel, Santa Tereza, is set high on the hills away from th busy beach areas. It is about a 20 minute cab ride back into the heart of town. After getting settled into our lovely rooms we had dinner in the restaurant in the lower garden of the hotel called Tereze. This is one of the best restaurants in the area and worth making the trip up if you are not staying at the hotel. The next morning after a lovely breakfast at the hotel we were taken to the famous Corcovado’s Christ the Redeemer. It is considered one of the most famous sights, built in 1931 by the Catholic Church. They have a small train that takes you to the top and an easy trip back down after you experience the amazing views. Then we were off to explore the beaches of Ipanema and a unique drink made with Dried Acari berries and a sweetener using a syrup of Guarana. This drink give you a charge like drinking 2 Red Bull shots. They use it to give extra energy, really gets your heart pumping. It was time for a little local shopping and lunch. Our guide dropped us off at Via Seth for lunch were we had our first experience of trying the fresh heart of Palm for a starter followed by several great salads. Then across the street to a great shoe store and the purchase of hot new gold or silver shoes. We returned to our hotel up in the Santa Teresa area, had a well deserved rest and got ready for dinner in the area. We walked down the street to a lovely local place Espirito Santa Teresa. The food was a true taste of Brazil, and very reasonable price. The next morning we got an early start since we were going to tour the other famous landmark, Sugarloaf. Sugarloaf is reached by a gondola ride up to the lookout and amazing views of the beaches below. You can wander around the whole platform take time for something to drink or local shopping from high end jewels to flip flops. Then we headed down to the port to see the huge murals painted by a famous artist “Konrad” this is a large graffiti project on old building along the new redone port area. On the way to lunch our driver took us to a good music store, Bossa Nova & Company on Rua Duvivier, 37A, in case you want to take home memories on a disk. Then we wanted to try a local dish called ACARAJE, our guide took us to “Academia da Cachaca” no tourist here, Ave Armando Lombardi 800. We started with fried bean balls, once again the heart of Palm grilled. When the ACARAJE arrived with the topping of small shrimp in a sauce, green onions and chopped parsley it was way better than we had ever read. Back to the hotel which took almost a 45 minute ride with the traffic. We had dinner reservations at 8pm back in town at the amazing restaurant, “Lasai” lasai@lasai.com.br. This restaurant is listed as the best in Brazil and in the top 100 in the world. You choose from either a 7 course tasting menu or choose a menu of fish, meat or veggie only. The food was lovely course after course prepared and presented with care. The owners are a young couple trained in New York at the CIA and they have brought all their ideas to Brazil and now use the food, herbs and history of Brazil in their lovely restaurant. Don’t miss it!!! The next day we were on our own to explore, we visited a couple of famous churches and the museum of local history at the port. Then went to see their big mall called Leblon, it is several floors of local and international shops. There was a food court on the top floor so we enjoyed Lebanese fare at “Farid” good service and a nice change of pace. We headed back to the hotel for a little pool time and a chance to catch our breath before dinner. Dinner was at the top of the hill from our hotel at a famous restaurant called “Aprazivel”, reservas@aprazivel.com.br. The view was wonderful looking out over the entire city. They can seat several hundred guests in many little rooms, each area offering great views. They made a good Caipirinha with several different types of Cachaca to choose from. The next morning we flew 2 hours north to the city of Salvador. This city was the place that in the late 1800’s most of the slaves were brought from Africa to Brazil to work in the sugar cane fields. Today the largest part of the population is still African. We check into our hotel, Villa Bahia, in the colonial area of Pelourinho a neighbor hood reserved and fixed up as part of the UNESCO cultural heritage. Our guide took us on a walking tour of the area, including the famous San Francisco Church. Salvador is the capital of the state of Bahia and still holds a vast array of cultural and artistic expressions showing all of Bahia’s charm. The square where the hotel is located is full of little shops selling local items. The small streets leading to the square offer nice music in the late afternoon and restaurants serving local fare. You will see little stand preparing the famous ACARAJE with ladies dressed in the old style local dresses with huge petty coats. The ACARAJE is served in a napkin with the salty shrimp and hot sauce topping the balls of mashed black-eyed peas. The hotel is older but quaint and in a safer location then other places. Dinner was down on the water at a place called “Amado”, amadobahia.com.br, serving continental cuisine. Everything is pretty close so not a big cab ride. We did get caught in a couple of big rain storms, it seems that when it is close to 90 during the day and the humidity is the same you will have afternoon cloud bursts. The next day our guide took us to the famous Bonfirm church, where people tie small ribbons on the fence surrounding the church which offers an amazing feeling as the ribbons tremble in the wind. It was famous for offering good wishes depending on the color of the ribbons you choose. Then we left for a tour of the area local fresh market with huge stands selling the dried shrimp, piles of fresh local fruit and everything from bird cages to chilies of every size. Our laSt night in Salvador we went to the famous restaurant of the city, Casa de Tereza” where we shared the Brazilian seafood MOQUECA. This rich stew arrives at the table bubbling in a cast iron bowl overflowing with shrimp and fish or lobster if you so choose. The dish is topped with cilantro and bright red peppers. This tradition al meal is a must when visiting this area and very filling so easy for 3 of us to share. The next morning flew back to Rio for the day before catching the late night flight back to the U.S.. As we headed back to the airport you realize that the favela’s occupy every hillside of the cities. You don’t go into them because of the crime but looking at them as you drive by gives you a deep feeling of the poverty of Brazil and the struggles of the poor. We arrive in Rio around lunch time and went to a restaurant off Ipanema beach called “ZaZa”, a combination of local fare and international dishes. 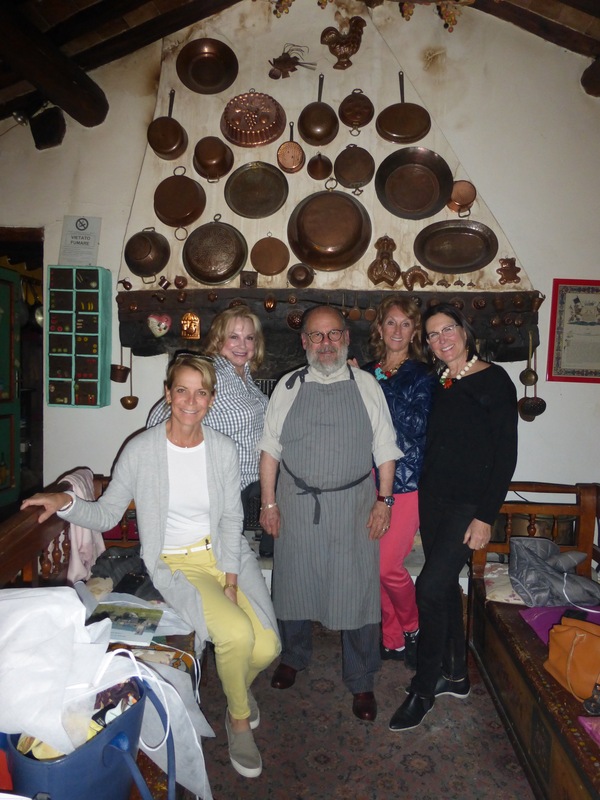 As you enter the corner door with all the crazy decor you will be welcomed by the hostess and you can either head upstairs to what resembles a Moroccan hideaway or dine downstairs where you see an interesting mix of locals and tourists. After lunch we said thank you to our great guide Rodrigo and headed to the airport, once again realizing all the hills are covered in the favela’s where the poor were pushed out of the cities a hundred years ago. We were happy we had the experience of Brazil and feel exploring a new part of the world is always worth the time. Whether you return to a place is determined by the food, people and culture you experience during your first visit.